The only mystery in this anime is the characters themselves. The show is a very enjoyable comedy, till around the last few episodes of the season (just like first season) then it just turns epic. I'd watched this as I had felt as though I should watch something utterly nonsensical and comical; whether or not it was serious hadn't truly mattered. This is my first true review and I hope anyone who reads it will enjoy it whether or not they agree. I'll begin with the plot. Setting is that of an era in the modern world where detectives and gentleman thieves pervaded throughout the world and both sides are challenge one another as black does white in contrasts, while utilizing the power of toys. That said, season two has little to no relevance to that anymore. The protagonists attend(ed?) a detective school and were once prodigies now only to be misfits in a field they have little usefulness in and have since accepted such a fact by apparently turn to farming. As we should all be expecting after the first season is a plot that is far from one being too serious with itself, one spontaneous and at times inevitably inane. Though even with those expectations as what were generally appeased by the first season, the second season seemed to have unfortunately been far too profuse with inane aspects and more than often redundant. Season two seemed unfamiliar and ultimately felt as though it was primarily filler the ending emphatically so. At this anime's best instances it was something to be enjoyed and is why I gave this a six rather than a five. Something certainly notable is this season managed in one episode to actually be serious, while comical and have a favorable execution. However at this anime's worst episodes/instances they'd be worth a three if not less. As for characters, Milky Holmes much to my surprise in season one (which continued to season two) does well with its cast, notably side cast. The antagonists, or more precisely the henchmen, execute their role well and as a result can be greatly comical and enjoyable as a whole; they each have unique characteristics and are among the few notable aspects, when they had been vehemently excluded from the final few episodes it had generally rendered those arduous to watch. However while management of the henchmen was enjoyable, new renditions I cannot state the same for; all new antagonists were either not detailed enough, or were generally cantankerous. On the other end of the side cast we have "G4" (Genius four) a police squad compiled of a myriad of geniuses. While it's all too coincidental they're all girls, I had no complaints (the anime was expected to profusely employ moe,) as all four of them had been enjoyable as well. Finally we have Milky Holmes. Season two had brought about an unexpected lack of intelligence in every aspect of their characters. They are almost unbearably idiotic. Season one had them being terrible at their job, whereas season two had them terrible at nearly everything....except farming. While this brought about a few comical scenes and had me laugh, that soon became seldom as a result of how repetitious any jokes from it became. Cordelia and Nero (mostly Cordelia) are practically bastardized throughout numerous instances of the series and the other two of the four which I had found some enjoyment in were generic cliches. Art and sound are what you'd expect them to be, there's nothing truly notable if you watched the first season. Overall and enjoyment I really wanted to give a five or even a four due to the awful final episodes in addition to the aforementioned cantankerous instances/aspects, but what this anime executes well, it executes notably well and has me ambivalent in doing so as a result. I honestly would not mind a few OVA's if not even a season that is focal on what this anime had done well, the side characters notably. (+) The humor was pretty good, and the art style got more colorful and strange, which just works really well with this show. My personal favorite episode was the one where Milky Holmes and G4 were on a train to stop a bombing (episode 6). (-) Though it makes a little more sense when you've watched S1, it's not really needed. One big thing, in my opinion, is that the humor doesn't hit it's stride until after episode 5, so just be forewarned that you may find the first couple of episodes more 'meh' than anything. 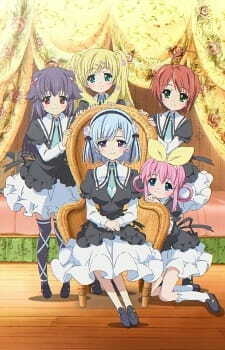 Let me start by saying I am a HUGE fan of Tantei Opera Milky Holmes season 1. The artwork was uber-cute, the story was usually nonsensical and hilarious, and I loved the characters! I don't think there has been an anime that has had me laugh so hard. That being said, I was so happy to see there was a season 2, I started into it right away. The first couple of episodes seemed a little off but I didn't really take notice. A few episodes in and I noticed that I was not laughing once during an episode. My love for the first season pushed me through until episode 10, and I just couldn't take it anymore. This season has disgraced the first season, and left me with a bitter taste in my mouth. The characters' personalities all but disappeared, and they all had basically the same personality, which was: lazy, stupid, silly, annoying. The story was non-existent and seemed like they were making it up as they animated it. Episode 10 was about the pig-man gaining super powers and sucking the lard out of everyone. He had lard power or something and I couldn't even finish the episode. I don't know what happened. The writers of the first season must have all been fired and replaced or something, idk. The art was still adorable, I'll give 'em that, but it can only do so much. Anyway, I'm done ranting now. I would honestly caution any fan of the first season not to watch season 2. They are nothing close to similar and watching season 2 left me with a bad taste in my mouth, and it will be harder to enjoy season 1 again. P.S.-The OP is actually wonderful.